You are currently browsing the daily archive for March 19, 2010. 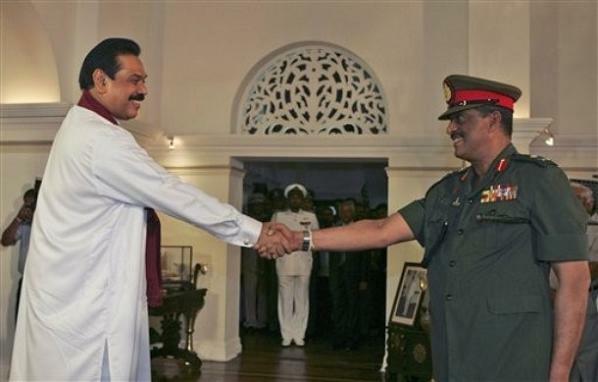 Sri Lankan President Mahinda Rajapaksa, left, shakes hands with Sri Lankan Army chief Lt. Gen. Sarath Fonseka during a ceremony to announce their victory against the Tamil Tiger rebels at Presidents’ office in Colombo,18 May 2009. In a context in which national reconciliation is so important, it is sad to see the manner in which a great gulf has developed between the President and his former Army Commander. His Excellency does not seem to have contributed to this through his pronouncements, though this is not true of all those in government. However the running in this regard has largely been made by the General, with some help of course from those who are running his campaign. Great problems often have their origins in small things, so it seemed worthwhile to look at the facts and try to understand how disagreement first began. In this regard reading the General’s letter of resignation was illuminating. In both versions, the actual letter he sent as well as that released prematurely and apparently prepared by his principal backers, he noted his belief that the President had lost faith in him. General Fonseka in pensive mood. At a press conference on Friday November 13th 2009, questions were raised as to the letter of resignation sent by Gen Sarath Fonseka. Anticipating such questions, Minister Mahinda Samarasinghe had obtained a copy of the letter, but I had not as yet seen it, and I therefore asked whether any of the journalists present had seen a copy of the actual letter, and what language it was in. One of the journalists was surprised, since I had mentioned earlier that I too had received a copy of the purported letter by email. I explained that we had had several instances of subtly changed documents being circulated, obviously for political purposes. The two different versions of the ISGA with the LTTE were foremost in my mind, given the explanation by a Sunday newspaper then of the fact that the wrong version had been sent to President Kumaratunga. It was suggested – and by a paper commonly associated with the opposition – that the mistake was deliberate, and designed to precipitate the then President into an aggressive reaction that could be shown up as absurd. A report in December 2009 in the ‘Sunday Leader’ that serious Human Rights violations were committed by the armed forces several months ago is extremely disturbing. The information is said to have been supplied by Gen Sarath Fonseka in an exclusive interview. Such a claim by Gen Sarath Fonseka is not new. There was also a report some months back of him saying something similar, but claiming responsibility for this himself. This report was a significant component of the American State Department report on possible war crimes. That said he made a speech at his old school, in which he had appeared in triumphalist mode. He was reported to have claimed that he ‘managed the war like a true soldier’ and resisted pressures from others, and thus ‘We destroyed any one connected with the LTTE’. That story raised questions which the government has pledged itself to answer through the committee appointed to report on allegations contained in the State Department report. In fairness to the State Department, it did not assert that Gen Fonseka had thus incriminated himself, but rather referred to reports which required explication. 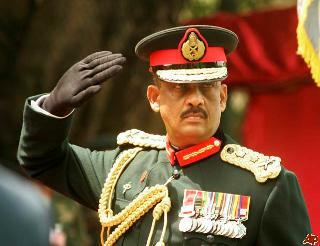 The government then is duty bound to question Gen Fonseka with regard to the report. The current interview makes it even more essential that the matter be inquired into.